Approaching Jefferson County Airport in Port Townsend. Being home based in Bellingham, we get to explore the Pacific Northwest in our Piper Arrow. 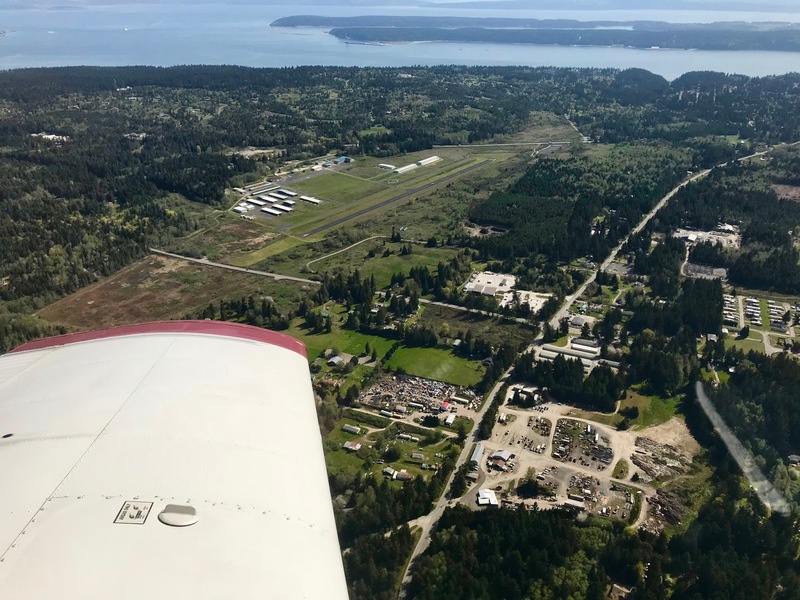 One of our favourite destinations is Jefferson County International Airport (0S9) near Port Townsend, Washington. One spring day we took advantage of clear skies to fly over for breakfast. There's an old saying, "hundred dollar hamburger." Flying isn't inexpensive. We decided to get some "hundred dollar eggs" instead. In addition to maintaining our flying skills, we gave our autopilot "George" some exercise. Linked to our GPS and ADS-B (Automatic Dependent Surveillance-Broadcast system) it makes flying in busy airspace safer. 997's panel with "George" in the upper left and the GPS in the center. The flight was in beautiful conditions, with blue skies and lots of sun. 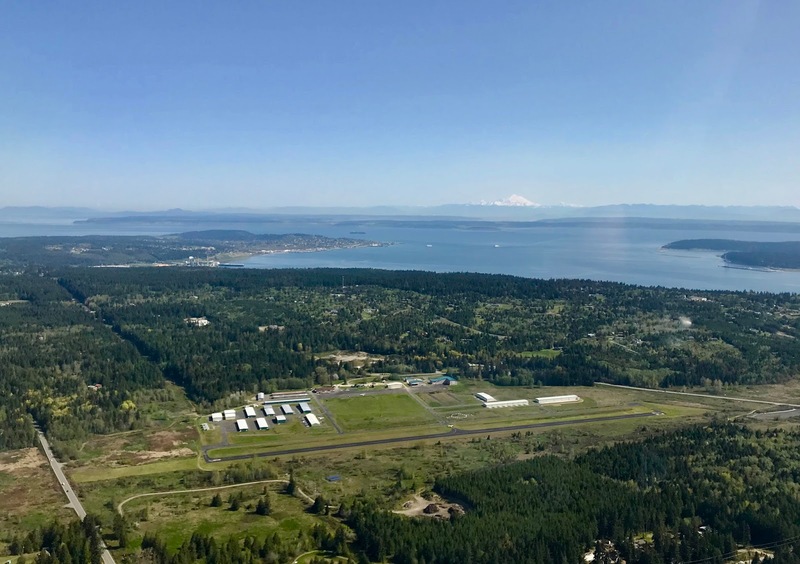 Looking over Jefferson County Airport towards Bellingham,. 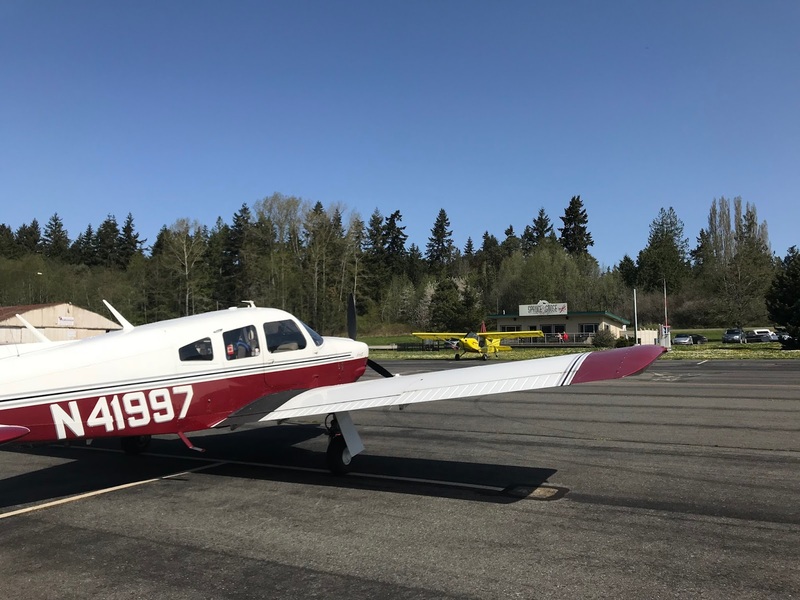 It takes about half an hour to fly from Bellingham to Jefferson County Airport. Come along with us on an abbreviated video of our flight. 997 parked in front of the Spruce Goose Cafe while we enjoy breakfast. We have flown extensively in the Pacific Northwest, and have camped under the wing of our airplane on many occasions. 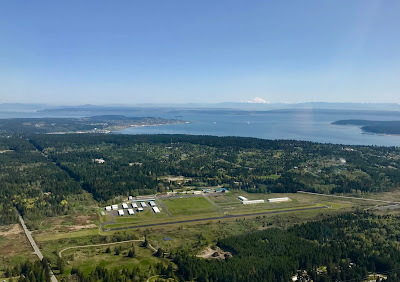 Want to read more about flying destinations in the Pacific Northwest? Check out Wayne's book Flying the Pacific Northwest. It's available in print and Kindle formats from Amazon. It's a glorious day. It's been great weather this past week for flying. Thanks for sharing your beautiful, scenic photos. Very cool to be able to fly around and see this beautiful part of the country! Lovely - enjoyed the trip. I was wondering why the instruction was given to switch to the fullest gas tank? (if I understood that correctly). What a nice way to go "out" for breakfast, and such a beautiful day. Oh what a lovely adventure for you both ~ great photos!